Upon seeing cutified bento, a normal reaction, aside from the usual “How can you eat that? It has eyes looking at you!” question is, “That must’ve been so difficult to make. I don’t have the patience to do anything like that.” The notion that kyaraben is difficult tends to stop people from trying, but it shouldn’t. Sure, a lot of really good kyaraben makers use so much time, effort and skill with their creations but the truth is, if you’re all right with starting with something simple and basic, anybody can prepare make their lunch cute. 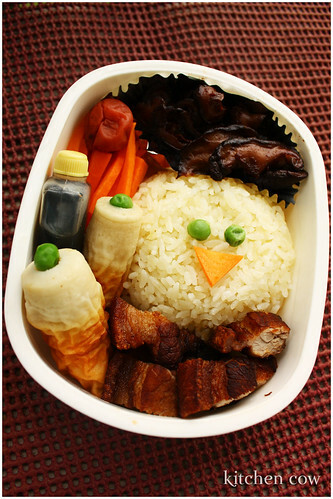 One easy way to prepare a cute lunch is to mold your rice into a cute shape. You don’t even need special molds; in this case, I simply used a piece of cling film to help mold my buttered rice into a circle. Because the buttered rice is yellow, I figured I can transform it into a chick. After molding the rice, I simply added green pea eyes and a small carrot slice fashioned into a beak. Very simple, right? What’s important is imagining what you can make with what you have. I then built the rest of the bento around the chick, adding some fried pork belly, sautéed shiitake mushrooms, jullienned carrots, chikuwa stuffed with mayo and garnished with peas, a bottle of soy-vinegar dipping sauce for the pork, and a piece of umeboshi, mostly to add color. It’s also important to fill your box and to make sure there are no gaps to ensure that your cute creation will reach school / work with the design intact. We’re headed to Singapore later and your food finds is already on our list! Wish us luck! Thanks by the way for the tips! love that lunch cute! hope I can have same bento…:( been on a diet so no rice for me.. I adore your blog and even though I am in the US I am relatively conversant in many Asian cuisines. But you have stumped me. I assume that the little things that look like Ice Cream cones are the chikuwa, but I have no earthly idea what that is. Possibly you could elaborate for those of us who are a little slow? Give it a shot, it’s easier than you think. Hehe, thanks Liz! Make one for your kiddie! btw, where do you get your containers for the dipping sauces? i’m having a hard time looking for containers that are small (and cute!) enough. thanks! I usually buy mine from Japanese groceries but it usually involves a lot of looking because they’re stocked very rarely. Are you based in Manila? If so, you can try stores like Hatchin and 88 peso stores. Good luck!